Launched in 2016, the Prison Education Program ends up being as meaningful for the participating UCLA students and faculty as for the incarcerated individuals they work with. Every Thursday and Friday, a dozen UCLA students from a variety of majors arrive on campus at 7 a.m., and take a 20-mile bus ride to Barry J. Nidorf Juvenile Hall in Sylmar. As the bus heads north on the 405 freeway, Bryonn Bain, UCLA professor of African-American studies and world arts and cultures, leads a group discussion about plans for the day, which includes sharing their concerns about stepping into a world that is far removed from the stately beauty of the Westwood campus. At Nidorf, the UCLA students will embark on a dual-role education. They’ll be earning UCLA credit as well as teaching and learning from the young men who are serving time for a range of crimes, some of them who never dreamed of marching across a UCLA stage in a gleaming cap and gown. Once on site, the Bruins relinquish their electronic devices, go through security, set up in a classroom and wait for the incarcerated students to arrive. They greet one another with handshakes, hugs and a community-building exercise before class begins. Bain, the UCLA students, fellow faculty, and the incarcerated students collectively make up the UCLA Prison Education Program. Launched in 2016, it creates innovative courses to be taught inside correctional facilities, with classes currently offered in Nidorf and which are planned to return next year to the California Institute for Women in Chino. UCLA is located in Los Angeles County, home to an estimated 20,000 incarcerated people, held in county jails and state prisons. According to federal statistics, there are currently more than 2 million people incarcerated across the United States, a tenfold increase since the 1970s. Nearly 40 percent of those incarcerated in the nation are African-Americans, who make up just 13 percent of the U.S. population. “As the most applied to university in the world, in the city with the most incarcerated people in the world, addressing this issue should be a centerpiece of the university’s commitments,” Bain said. The prison education program aims to help participating students change their life trajectories through education, and to better educate UCLA students, faculty and the public about how prisons make an impact in our lives, communities and the nation. In the United States, the recidivism rate — or how often incarcerated people return to prison within five years — is 76 percent. A study by Emory University found that rate drops to 55 percent if a formerly incarcerated person takes high school classes, and further lowers to 30 percent for those who complete vocational training. 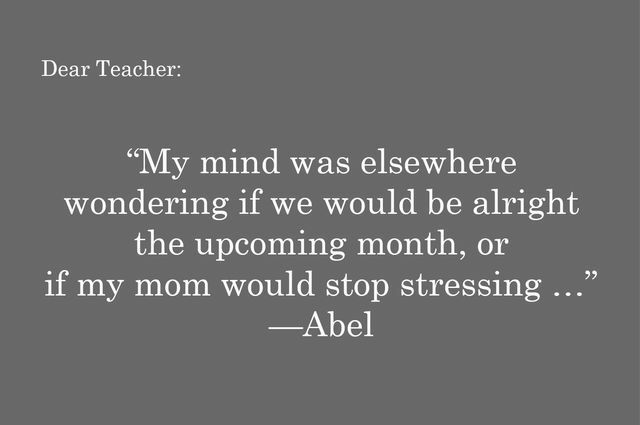 In a project called “Dear Teacher,” a student at Barry J. Nidorf Juvenile Hall named Abel reveals why he was distracted in class. Meanwhile, earning an associate’s degree drops the recidivism rate to 13.7 percent, a bachelor’s cuts it to 5.6 percent, and a master’s degree virtually guarantees that a person will never return to jail — with a zero percent recidivism rate for people who complete a graduate degree. It was the opportunity to make such a tangible difference in people’s lives that drew Rosie Rios to the program when she was an undergraduate majoring in sociology with a minor in labor studies. Last spring, Rios and UCLA classmate Lauri Label spearheaded the creation of a collection of essays from the incarcerated students titled “Dear Teacher.” Eight young men wrote what they would say to teachers they encountered in schools prior to being convicted. Their letters paint a picture of a system that failed to engage or support them in the wake of challenging home lives and communities enduring underfunded schools, low incomes, high levels of policing, poverty and crime. In their writing, some students acknowledged the efforts of teachers who reached out to help, and took responsibility for their own actions. For some incarcerated students, taking a UCLA class is something they have never dreamed of. Three of the students who participated in the “Dear Teacher” assignment are still in Nidorf. Of the other five, one was released and four went on to adult prison. Carlos, among those still in the juvenile facility, said the classes and UCLA students have given him hope where there wasn’t any before. 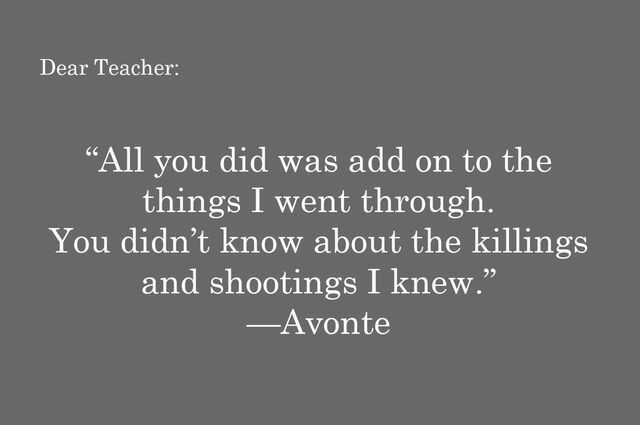 In his “Dear Teacher” letter, Avonte shares how his teacher’s criticism served to pile onto his day-to-day fears. This quarter the prison education program is teaching issues of justice through a performance-based course, with a class titled “Legislative Theater for Radical Justice: In the Incarceration Capital of the World.” It is offered through the UCLA departments of African American Studies and World Arts and Cultures/Dance, taught by Bain, UCLA lecturer Bobby Gordon and visiting scholar/artist Alessandro Conceição from Brazil. This interdisciplinary course uses a Brazilian method of participatory theater that evolved in the 1970s and is known around the world as “Theater of the Oppressed” to develop anti-racist strategies and legislative proposals to address mass incarceration. 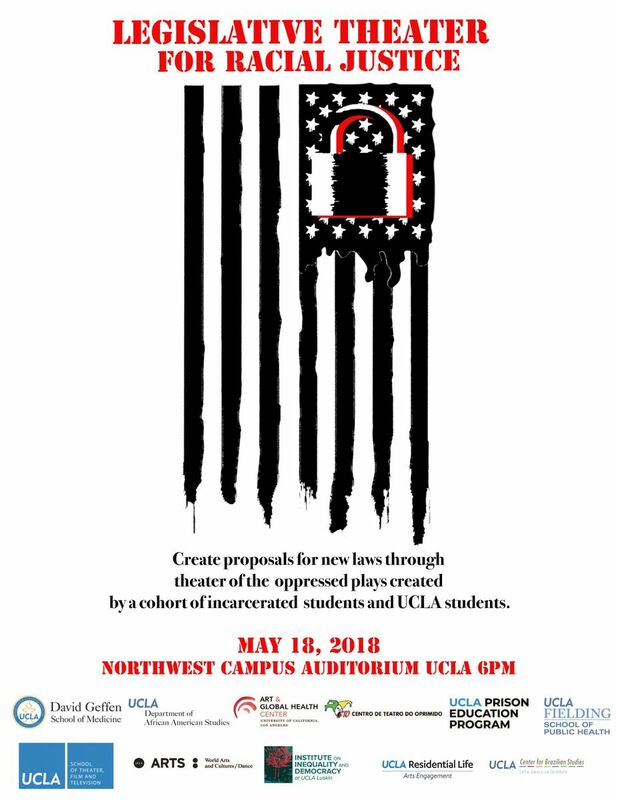 On May 18 at 6 p.m. in the Northwest Campus Auditorium on the Hill, the UCLA community and the public are invited to participate in a live performance based on the “Legislative Theater for Racial Justice” course. Students and teachers from the program will partner with the audience to create on-the-spot theater based on issues of oppression. A longtime theater, spoken word and hip-hop performer, Bain began working at Nidorf in 2015 with a community organization called Inside Out Writers. It was with IOW that the foundation for the Prison Education Program’s work at Nidorf was laid with leadership from Danielle Dupuy, assistant director at UCLA’s Ralph J. Bunche Center for African American Studies and a doctoral candidate in the UCLA Fielding School of Public Health. Inside Out Writers has been offering writing programs at prisons across California for more than two decades. “I knew I wanted to focus on the issues of incarceration and the well-being of black communities — and for that I knew I had to be out in the community figuring out what’s going on,” said Dupuy, who is completing her doctorate this year. 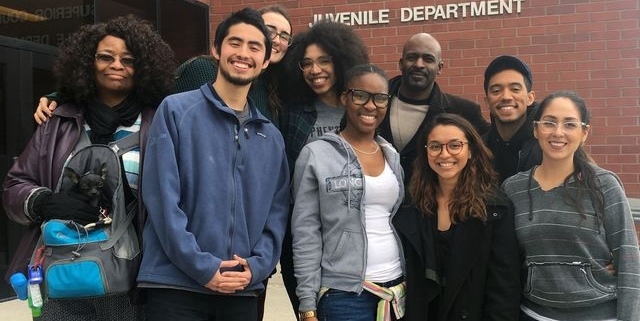 Each quarter, before classes begin inside the facility, James Jacob, director of Nidorf juvenile hall for the Los Angeles Detention Services Bureau, comes to campus to meet with the new batch of UCLA Prison Education Program students and faculty. Allies of the program, many of them formerly incarcerated individuals, and other community partners also give incoming participants a primer in themes of privilege, assumptions, trauma, safety and academic integrity — all through the lens of how to prepare for and navigate these issues within the confines of a prison. A recent grant from the Roy and Patricia Disney Family Foundation currently provides transportation for UCLA students and faculty, tuition and books for 10-15 incarcerated students each quarter for the next two years. Prison education programs like this face an uphill battle, Bain admitted. Resistance comes in many forms, even sometimes from people who work within the university, or inside these facilities. 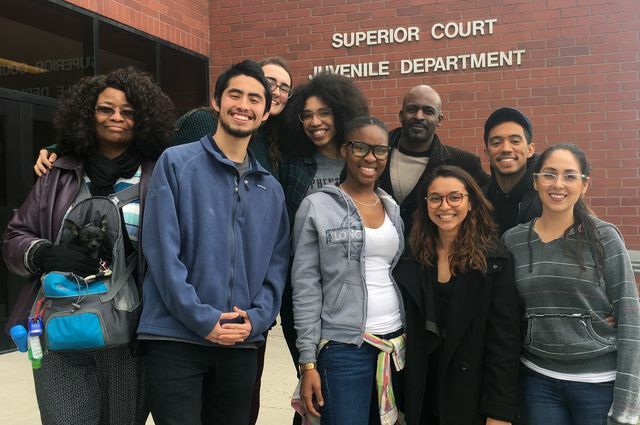 But the ultimate goal, with invaluable UCLA support of the student-run and student-founded Justice Work Group, the Underground Scholars Initiative and the Bunche Center, is to end of the era of mass incarceration in America.